Enjoying the hustle and bustle of the upcoming holidays? Need a few quick gift giving ideas or maybe a new project for yourself? Ivy Brambles Arrow Head Socks Kit! Really pretty and just released! 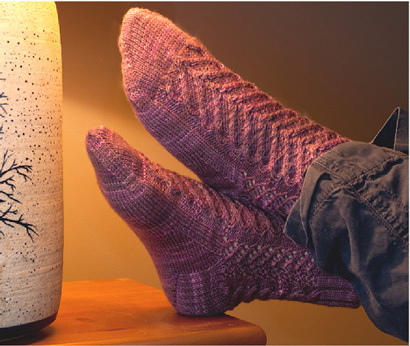 A fun sock pattern by designer Patti Waters featuring an intricate arrow head cable pattern. Why not make socks that are this much fun! Quick and easy mitten kits - available now in Worsted and Super Bulky weights - you choose how fast you want to knit these gems! 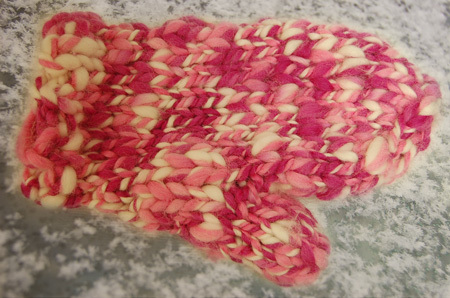 Nancy's Warm and Fuzzy Mitten Kit feature mittens that are fun, fuzzy and very warm. These great mittens are easy to knit and fabulous to wear, knit with two strands of worsted weight yarn, the fuzzy effect created by using one strand of mohair yarn together with a regular wool yarn. 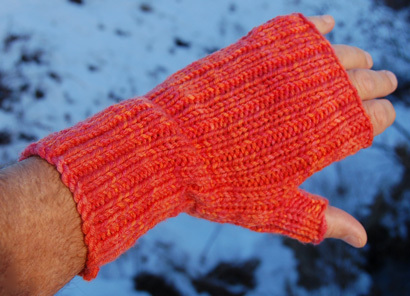 The Super Bulky Mittens Kit features a mitten project that is super fast and easy. 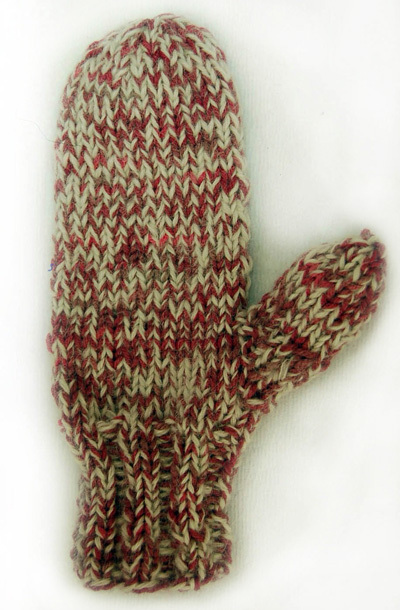 These mittens are great for either a man or woman, knit in super bulky yarn they require just 66 yards of any suitable 2 – 3 sts per inch yarn. 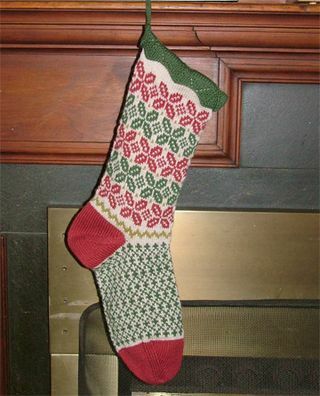 How about the new Pepita Christmas Stocking which takes four colors of worsted weight yarn? This stocking is worked from the top down, with an easy lace cuff, stranded colorwork leg and foot, and an "afterthought" heel. We have kit this lovely stocking with appropriate colors of Cascade 220. A lovely beret is always comfortable with any outfit and knits up fast and easy using the Antenor Beret Project kit. This lovely design from Alison Green Will, the pattern is written in two sizes, and a floppy and a regular version – so, four possibilities total (small/regular, small/floppy, large/regular and large/floppy). 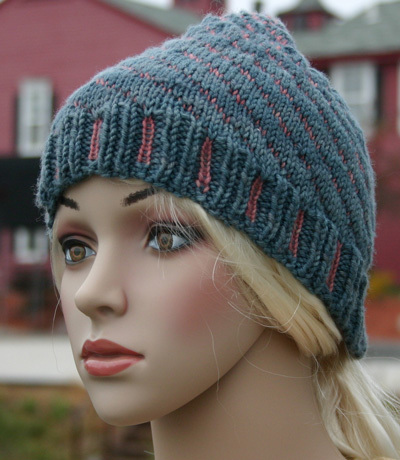 The hat is made by knitting the cable band lengthwise, then picking up stitches and knitting the hat body in the round. The beret requires approximately 160 yds / 143 m for regular style, or 200 yds / 183 m for floppy style, light worsted weight yarn. We have kit this design using 1 Skein of the Ivy Brambles Superwash Worsted Yarn....another, winning pattern that works well in any colorway. A beautiful and fast scarf is the gorgeous Prism Drop Stitch Scarf Kit. 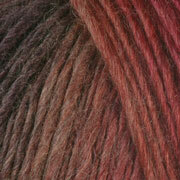 One skein of Prisms hand-dyed Stuff yarn creates an array of color and texture in any pattern. This kit comes with a free pattern from Ivy Brambles with an easy drop stitch or you can simply work this yarn in a garter stitch - the yarn does all the work to make any simple and quick pattern easily a work of art. And for addition artistic flutter, tie on some Prism Galaxy ribbon. This is great in any color and works up really fast! 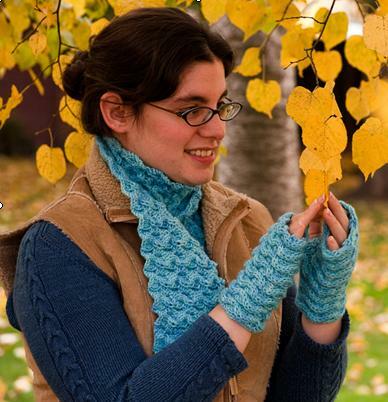 A new favorite, the Water Scarf and Mitts Project Kit. 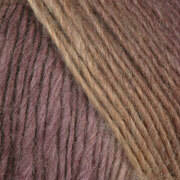 Only two skeins of Ivy Brambles Superwash Worsted yarn makes the lovely scarf and mitts set! Each is worked lengthwise so adjustments are easily made and you only need to knit to the width you like! Need a quick sweater! The Penny Straker Becky Pullover Kit is for you! This classic raglan sweater easily becomes the essential sweater that everyone pulls on for a cold day. We have kit this for you using Eco Wool and Eco Wool Plus making this an affordable and fast project that everyone likes. All the color look great and the pattern is written for a 32 - 50 finished chest size. 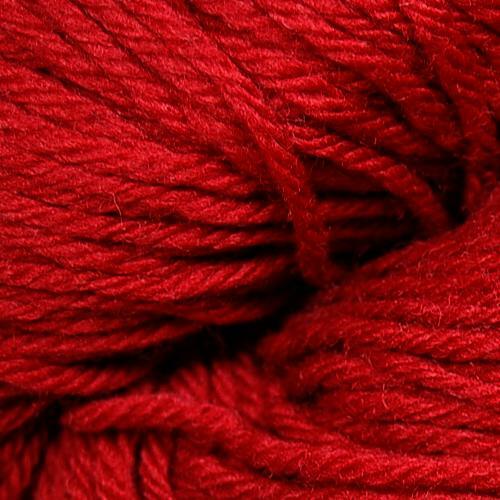 Three to four skeins is all it takes! 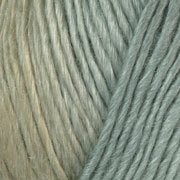 Nothing is faster than a simply garter stitch design - here is one you are sure to love. The Penny Straker Andy in Child's or Adult sizes. Andy is a beginners delight worked on #7 needles in Garter Stitch. With an easy-to-knit drop shoulder and a comfortable shape, Andy is appropriate for a multitude of yarns and tweeds, boucles and cottons, to wool blends, handspuns and colorful variegated yarns all lend themselves to this design. 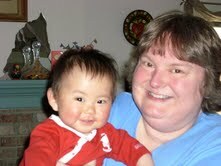 The adult pattern runs sizes 32-44 and the childs pattern runs sizes 2-12. These two worsted weight designs are great in Ivy Brambles Superwash Worsted, Cascade 220, Cascade 220 superwash and Cascade 220 Tweed, as well as the other multiple worsted yarns in our inventory. Send a card that shows the love of fiber to your friends! Itty Bitty Witty Knitties are perfect all year round and are sure to bring a smile to the sender and receivers face! 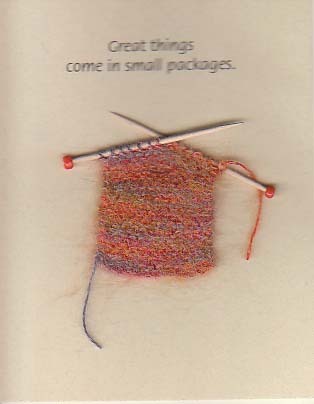 Each card has a wonderful knit swatch on the front with a delightful and fun fiber phrase to greet the receiver... an example is - Did you know it takes 3 llamas to make a medium-sized sweater? - and then the inside reads - I didn`t even know llamas could knit! Other great card lines are the inspiring and beautiful greetings cards from artist Emily Morgan. 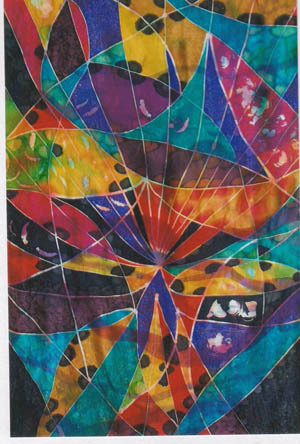 Each card features a photographic reproduction of an original Emily Morgan Handpainted Silk design. Cards are blank inside making them suitable for any occasion. Card size is 5 x 7 inches approximately and comes with a matching envelope. Also, Knitting with Friends Greeting Cards offer both fun and delightful phrases as well as cute little animals making good use of their existing fiber. 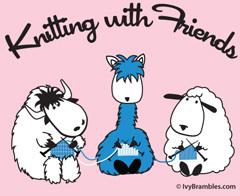 - Knitting with Friends Shirts available in different sizes, colors and designs and come in long sleeve, short sleeve, v-neck, crew neck and tie dye. Also available in designs for crocheters and spinners. 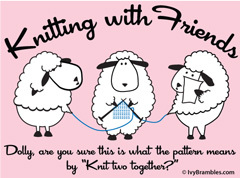 - Knitting with Friends Tote project bags available in different sizes, colors and designs. Also available in designs for crocheters and spinners. 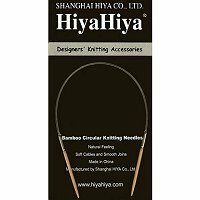 - Hiya Hiya Interchangeble Needle Sets are sure to please and come a beautiful case made of a lovely silk brocade and cotton twill. - Also, just in from Ireland, in a limited number, Sterling Silver 3/4 inch Spinning Wheel Pendant with matching chain. A great gift for the spinner in your life. We will be adding more project kits this week for fast and easy gift giving... we have new patterns coming in daily for hats, mittens, socks, and sweaters so check back often.